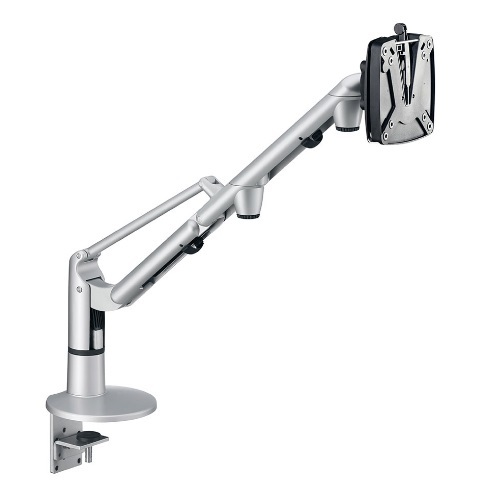 The LiftTEC Arm II features a gas spring for easily adjusting the height, angle and distance for a perfect ergonomic fit. It provides a clean, modern style to suit any work environment. Move smoothly and stay in place with one-handed operation, providing easy adjustments for a perfect personal fit. Two-part monitor arm with a range of 20.28″ and a maximum height of 16″ above the desk surface. Gas-Spring Technology makes it easy to position the monitor and keep it in place. The entire arm can be rotated 360° on the table mounts for shared viewing. The Arm II is equipped with a QuickRelease monitor mount – simply click the monitor in place and tilt to the perfect viewing angle. Cable clips are included to maintain a neat, organized appearance. Base: System Clamp/Grommet/Drilling Screw - contains all three mounting adapters for securing the monitor arm to the edge of a flat surface or through an opening on a flat surface.